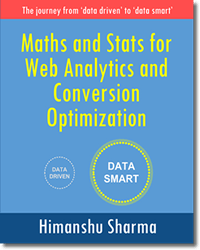 Measurement protocol is a set of rules which your application must follow in order to send raw hit data directly to Google Analytics server. Measurement protocol is used and beneficial for implementing cross device tracking. Through this protocol you can collect and send raw user interaction data (hits) directly to GA server from any device/system which can be connected to the internet. This device/system can be a smart phone, tablet PC, digital appliances (washing machine, coffee machine, slot machine), point of purchase systems etc. 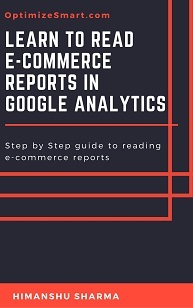 However, you need to format your data according to the measurement protocol before you can send it to the Google Analytics server. So for example, if you want to send data from your washing machine to the Google Analytics server, then you first need to format the data according to the measurement protocol. Similarly, if you want to send data from a cash counter machine, coffee machine or slot machine then you first need to format the data according to the measurement protocol. Without such formatting, you can’t send data to GA. 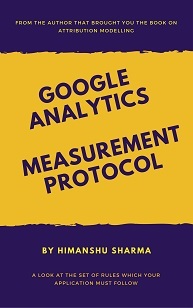 Through measurement protocol you can measure offline conversions in GA. 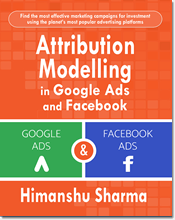 Thus it helps in understanding the offline behaviour of the customers and help in fixing attribution modelling issues. Note: You don’t need measurement protocol, if you just want to send hit data from a website or mobile app. 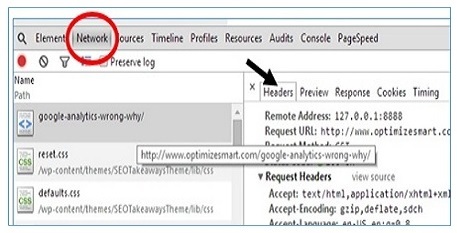 Use the Google Analytics tracking code for website/mobile app for that purpose. You can collect and send only hit data (pageviews, screenviews, events, transactions etc) via the measurement protocol. 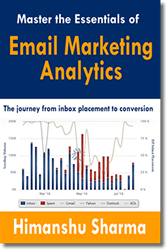 You can’t collect and send data in aggregated form (like tables) via measurement protocol. In order to understand the measurement protocol request, you first need to understand HTTP Requests and HTTP Responses. All web browsers and web servers communicate with each other by sending HTTP requests and HTTP responses. A web browser communicate with a web server by sending HTTP request for each requested resource (like html document, image, css etc). The web server communicates back to the web browser by sending HTTP response for each HTTP request. Step-1: Open Google Chrome browser. Step-2: Navigate to a web page. Step-3: Right click on the page and then click on ‘Inspect’ from the drop down menu. This will open up the ‘Chrome Developers Tool’. On the right hand side of the developers’ window, you can see all the HTTP request and response headers. In order to make an HTTP request to the GA server (for sending the raw hit data directly), you need to format your HTTP request according to the measurement protocol. This formatted HTTP request is called the measurement protocol request. 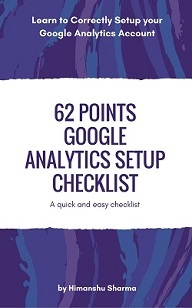 Step-2: Navigate to the web page which has Google Analytics tracking code installed. Step-5: To see the measurement protocol request, type ‘collect’ in the text box (shown below) and then press the enter key. User agent is a string that your web browser send to a web server, in order to identify itself. 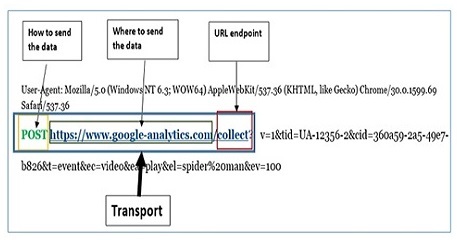 Payload data is the data you send to Google Analytics server using the measurement protocol. In other words, the payload data is the data which has been formatted according to Measurement Protocol. The payload data resembles a URL query string (query string is the part of the URL which comes after the ‘?’ Character). 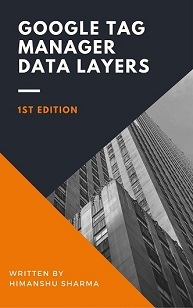 Payload data is made up of multiple parameters. Each parameter is made up of ‘key = value’ pairs. #1 Single hit payload – the payload data in which only one hit is sent to the GA server. 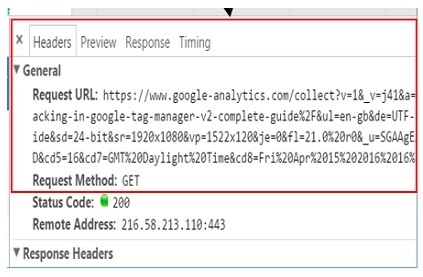 #2 Multiple hits payload – the payload data in which multiple hits are sent to the GA server. Note: The size of single hit payload cannot be greater than 8k bytes. 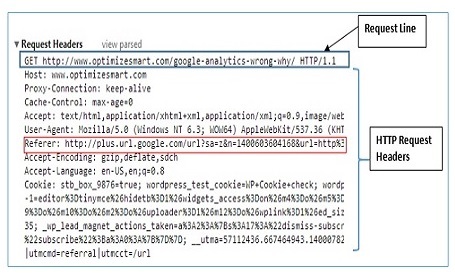 #3 URL endpoint – this is used to define whether a single or multiple hits should be sent to the GA server or whether to send the payload data to measurement protocol validation server. Parameters which are required for particular hit type. Parameters which can be sent for a particular hit type. 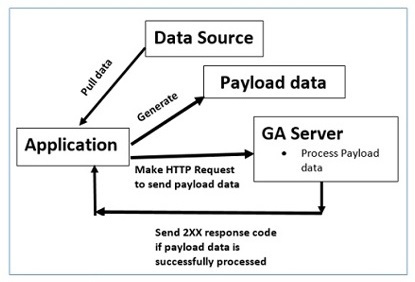 When GA receives the HTTP request from your application, it try to process the payload data in the HTTP request. If GA is not successful, in processing the payload data, then its server does not send any error code back to your application. #1 You have the permission to use it, from the rightful owners. #2 You are not going to collect any personally identifiable information (names, email addresses) or any data that can help in identifying a particular user by his/her device. #3 You have given your end users, proper notice about the data you are collecting via the measurement protocol and how you will use the data, as well as the option to opt out from being tracked. Payload data is made up of multiple parameters. Each parameter is separated from another parameter via & character. Since each parameter is made up of ‘key = value‘ pairs, so each ‘key=value’ pair is separated by ‘&’ character. Here v, tid, cid, t and dp are called the keys. ‘1’, ‘UA-123456-2’, ‘36009a59-2a05-49e7-b826-2b884d0f935b’, ‘pageview’ and ‘%2Fhome’ are called the values. All values you sent via measurement protocol to GA, must be both UTF-8 encoded and URL encoded. Note (2): All protocol parameters must be set on the same line. They should not have any spaces between them. Comments are not allowed in protocol parameters. Currency – used to represent the total value of a currency in up to 6 decimal points. ‘v’ is used to denote the measurement protocol version. The value of this parameter should be 1. ‘tid’ is used to denote the tracking ID. 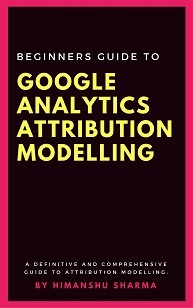 The value of this parameter should be the property ID of your Google Analytics property, where you want to send the payload data. ‘cid’ is used to denote the client ID (ID which anonymously identifies a particular device, or browser and is unique to a particular visitor/user). ‘t’ is used to denote the hit type. The value of this parameter can be be anyone of the following: ‘pageview’, ‘event’, ‘social’, ‘transaction’, ‘item’, ‘exception’,’appview’ or ‘timing’. There are rules regarding which parameters can be sent together and which parameters can’t be sent together. There are rules regarding the length and format of parameters. Each parameter has specific type that requires a particular format. Each payload data must contain a valid hit type. Each hit type must have its own set of required parameters set. 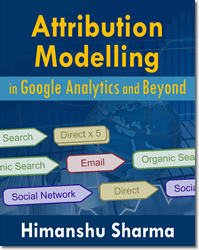 All values of the parameters must be URL encoded before they are sent to the Google Analytics server. For this reason the URL https://abc.com was first encoded to http%3A%2F%2Fabc.com before it is passed as a value to the ‘dr’ parameter. Note (1): All text values have size limit which is expressed in bytes. You can send payload data by either using the GET method or POST method. Google recommends using POST method, as then you can send larger payload data to GA server. This is where we send the payload data. 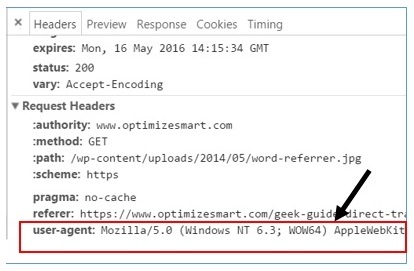 The payload data need to be URL encoded if you are making HTTP POST request to the GA server. 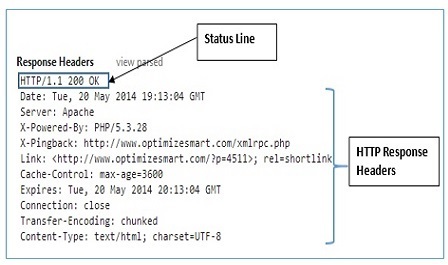 The size of Payload data, if you are making HTTP POST request to the GA server can be maximum of 8191 Bytes. However, if you make HTTP GET request to the GA server, then the size of payload data cannot be more than 2000 Bytes. Another downside (the first downside is the inability to send large payload data) of making an HTTP GET request to the GA server is that, GET request may get cached and when it get cached, the request is no longer unique and hence subsequent requests are retrieved from the cache and not sent to GA.
To prevent HTTP GET requests from being cached, add the parameter called ‘Z’ at the end of the payload data. Assign a random number to this parameter. Note: If you are making HTTP GET request to the GA server then the payload data needs to be in the form of URI escaped query parameters. Use the ‘/batch’ endpoint to send multiple hits in a single HTTP request. Note (1): when you are sending multiple hits in a single HTTP request then specify each payload on its own line. Note (2): The HTTP request which contains /batch end point is called the Batch request. You can send maximum of 20 hits at a time per batch request. Note (3): The total size of the payload data in a batch request cannot be greater than 16k bytes. You can validate protocol hits by sending them to the measurement protocol validation server. 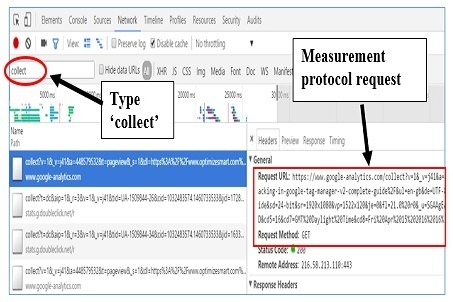 #1 Chrome developer tool – You can use the ‘console’ or ‘network’ tab of the chrome developer tool, to see the details of the measurement protocol hits, as explained earlier. 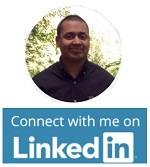 # test sending payload data over secure connection.